The Bett Awards are a celebration of the inspiring creativity and innovation that can be found throughout technology for education, rewarding the most outstanding edtech suppliers in the industry. Music is a core part of the national curriculum at primary level and can contribute enormously to creativity, well-being and child development. 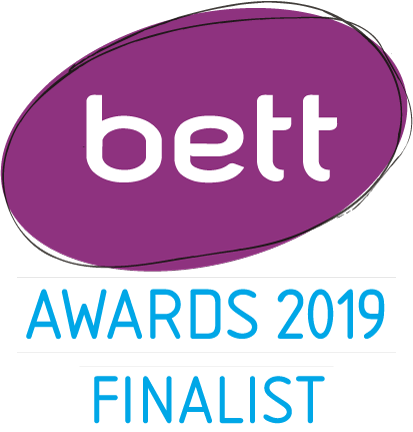 The Bett Awards celebrate excellence in educational technology and in nominating Musical School as a finalist in the Primary Content category they recognise Musical School’s huge impact on music provision and the combination of expert pedagogy, design and musical content needed for widespread adoption. Musical School is used by over 1 in 3 primary schools in the UK. Over the past 12 months it has reached more than 2 million children in over 60 countries every week. One real challenge is that schools are increasingly having to use non-specialist teachers to deliver music. Musical School provides massive support for non specialists boosting their knowledge of the subject and their confidence in teaching it. Charanga has completely changed the way the non-music specialist staff (ie all my staff but me!) feel about teaching music. They are all now teaching music, having previously done anything they could to avoid it. The children love the games and different styles of music they encounter. They are gaining confidence in composing and improvising. Many thanks. Musical School also contains a substantial SEND (additional learning needs) area containing a bespoke Scheme of Work suitable for non-specialists and specialists, a special library of resources and a set of iPad projects which work right across the SEND spectrum. Thank you So MUCH – you would not believe how helpful this is…We love you here! Charanga also provides in-depth support for Music Education Hubs – organisations who work together to support joined-up music education – with over 85% embracing Musical School’s flexibility, integrating it into their own professional teaching and support programmes for schools. Charanga are fantastic to work with and impressively informed where it comes to organisational transformation in music education. Charanga has been acknowledged widely in the world of music education with awards in the Best Digital Resource category at the Music Teacher Awards for Excellence for the last two years. It is, though, particularly satisfying to receive a nomination for such a prestigious award in the wider, global educational technology space . A key feature of Musical School is the use of technology, great visuals, beautifully orchestrated backing tracks mixed with fantastic and well-known repertoire. More importantly is the fact that schools use Musical School on a regular basis and both the pupils and the teachers enjoy and value it. A big thank you must go out to our music hub and content partners, our fantastic teachers and of course the eclectic technologists, educators and music people at Charanga – well done everyone. If you would like to experience the unique benefits of Musical School, please contact Charanga on +44 1273 823900 or info@charanga.com or get a 30-day no obligation free trial for your school here charanga.com/site/musical-school-trial. Formed in 1997, Charanga is the UK’s leading provider of music education technology and digital resources for schools. Founded by Royal College of Music graduate Mark Burke and computer scientist Paul Fletcher. Mark and Paul were friends from a very early age. They went to school together in Bolton and played in the same Thornleigh football team. While following different career paths, Mark in music and Paul in educational technology, they came together to form Charanga with the aim of combining their skills to build a new type of teaching and learning resource. Today, Charanga’s philosophy of working closely with the leaders and visionaries of the music education field has enabled them to play a significant role in shaping the country’s cultural heritage. Proud to be a key partner in over 110 of England’s Music Education Hubs and networks, Charanga has made sure that no schools are disadvantaged by local issues but able to access programmes directly.